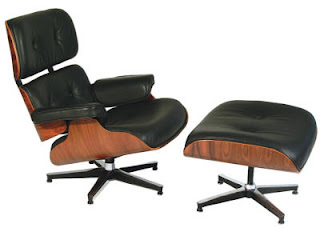 The Eames Lounge Chair and ottoman. The Eames Lounge (670) and Ottoman (671) was first released in 1956 by designers Charles and Ray Eames who worked for the Herman Miller Furniture Company. The Chair is made from molded plywood with thin wood veener guled and shaped under heat and pressure. The seat cushions were usually covered in leather. This is just one comfortable looking chair and they style is timeless. The unfortunate problem is the insane cost the chairs are fetching. Upwards of $7000 USD. There are knock off versions to be had and sometimes you can find one in rough condition at used furniture stores. The search for an original Eames is always on, however I'm not getting my hopes up on this one. Wow that is fantastic!! find more Modern Retro Furniture from Casamodern.